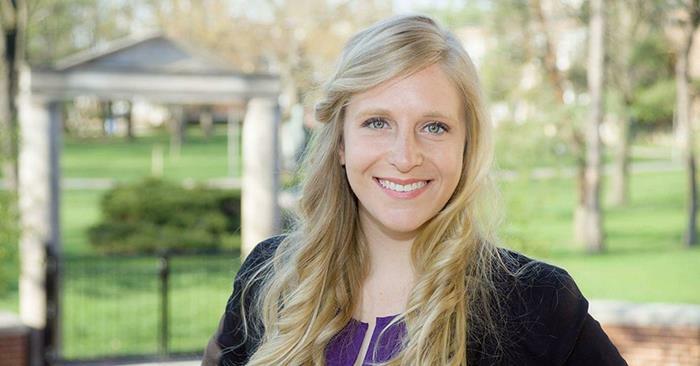 Recent graduate Christy Crouse is the recipient of the 7th annual Mario Vargas Llosa Award. Bestowed by Sigma Delta Pi, the National Collegiate Hispanic Honor Society, and the American Association of Teachers of Spanish and Portuguese (AATSP), the award is granted yearly to one undergraduate Spanish major or minor who has demonstrated outstanding achievement in all upper-division courses completed and exemplary involvement in extra-curricular activities as related to Spanish. Crouse will be recognized formally at the 99th Annual Conference of the AATSP in Chicago, Ill., during the awards banquet. 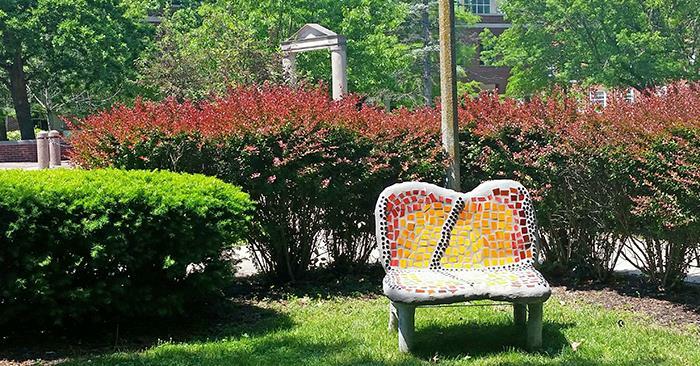 Thanks to an art class project, there are a few new places to take a seat on campus. Students in Danielle Yakle’s visual arts class created three pairs of benches, which have been installed at various locations around campus. The students were tasked with creating works that are simultaneously functional and creative. 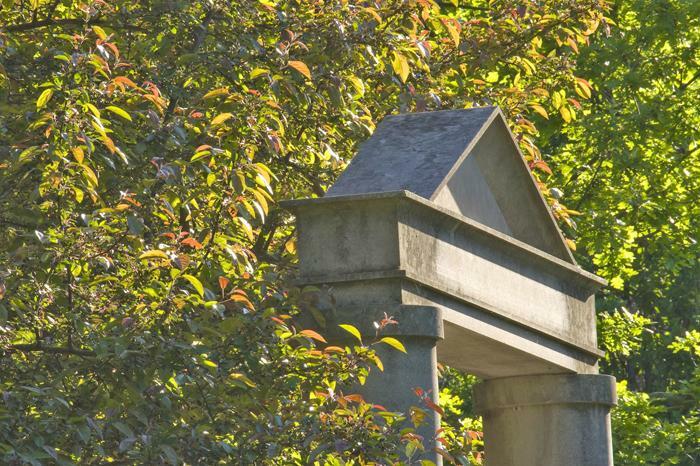 They are designed to encourage the campus community to enjoy nice weather while engaging directly with a work of art. The benches are similar to the recent sea dragon and octopus sculptures in terms of materials and technique. Each bench has a steel armature that is filled out with rigid builder’s foam and wrapped in wire mesh. The wire is encapsulated in layers of concrete and embellished with glass mosaic. Each bench is approximately three feet high, four feet long and two feet deep. Benches can be found in pairs in the courtyard of Blanton-Nason-Brewer Hall, on the Quad near Ophelia Parrish and between Kirk Building and Kirk Memorial. Installed in early May, the benches are scheduled to remain on campus until October. 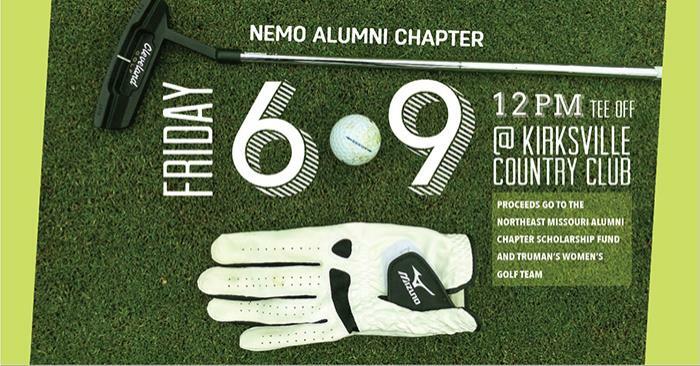 Everyone is invited to the NEMO Alumni Chapter Scholarship Scramble, June 9 at the Kirksville Country Club. Registration opens at 10:30 a.m. Join University President Sue Thomas for lunch on the patio at 11 a.m. Tee off is at noon. Prior to the tournament, there will be a putting contest and longest drive contest. Everyone is encouraged to compete, and teams are not needed to participate. The NEMO Alumni Chapter Scholarship Scramble is a four-person tournament. Team registrations are encouraged, but individual golfers are also welcomed and will be grouped together. 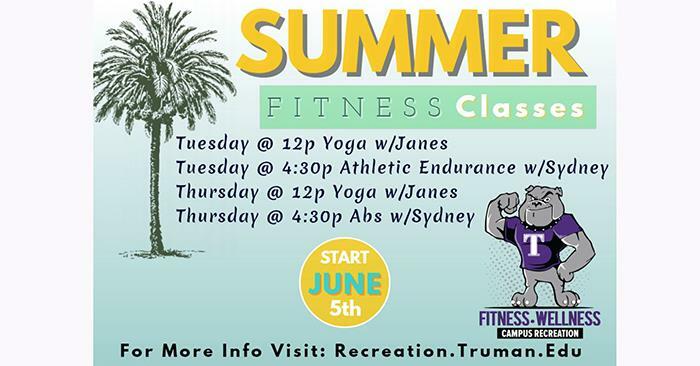 A portion of the proceeds also benefit Truman women’s golf. For the first place team in each flight, golfers will receive a $50 Kirksville Country Club gift certificate. 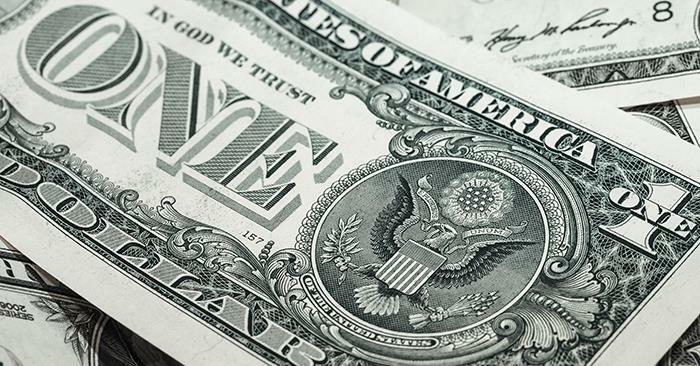 Second place team members will receive $25 Kirksville Country Club gift certificates. Registration includes 18 holes of golf, lunch, soda, golf goodie bags, plus a closing reception with appetizers and door prizes. Cost is $65 per golfer or $260 per team. Cart rentals are available on a limited basis. 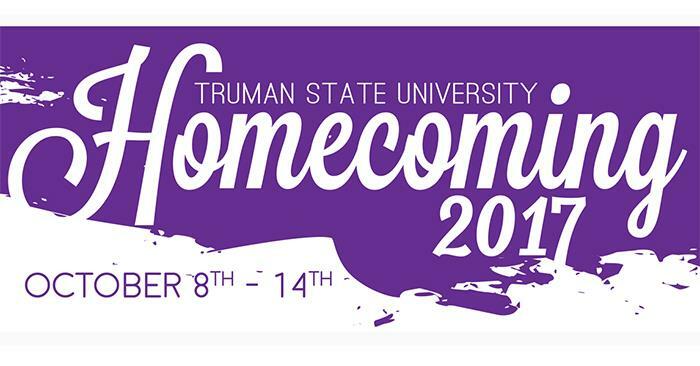 Registration can be completed online at alumnistore.truman.edu/product/2017-northeast-missouri-alumni-chapter-scholarship-golf-scramble, by email at alumnievents@truman.edu or by calling 660.785.4133. 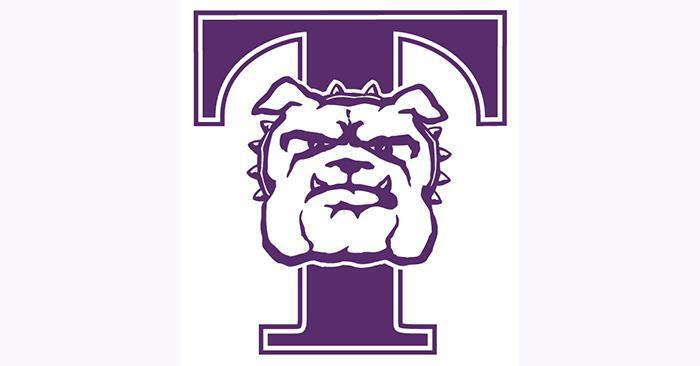 Truman has been named as the recipient of the Great Lakes Valley Conference’s James R. Spalding Overall Sportsmanship Award for the 2016-17 season. This accolade is Truman’s first-ever GLVC Sportsmanship Award. The Bulldogs accumulated the most points during the 2016-17 season, featuring team sportsmanship wins in women’s cross country, football, women’s soccer, women’s swimming and baseball. During the initial nomination process, each institution’s coach ranked the top-three teams within the sport that best displayed good sportsmanship throughout the season. The team with the highest point total was then named that sport’s James R. Spalding Sportsmanship Team Award winner. At the conclusion of the academic year, the institution that accumulated the highest point total across all sports was named the James R. Spalding Sportsmanship Overall Award winner. In addition, each institution - through the head coach - names one award honoree in each sport sponsored. These individual sport honorees became candidates for the James R. Spalding Sportsmanship Award. Each institution then selected one male and one female student-athlete from its season-long list of honorees to be named as James R. Spalding Sportsmanship Individual Award winners. Kayla Bastian, volleyball, and J.J. Dorrell, wrestling, were named as the Bulldogs Spaulding Sportsmanship Award winners. Members of the faculty and staff celebrating their retirement, 5th, 10th, 15th, 20th, 25th, 30th, 35th or 50th anniversaries of service to Truman were honored at the annual Service Recognition Luncheon May 17 in the Student Union Building Georgian Room. In the photo above are the 2016-17 retirees honored at the Service Recognition Luncheon. 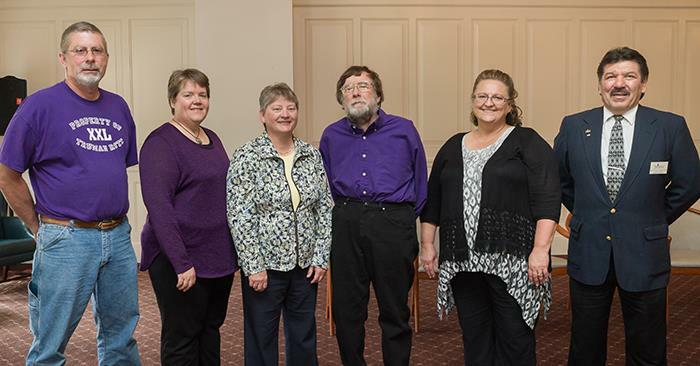 Seated, left to right: Stephen Hadwiger, Neil Gilchrist, Lou Ann Gilchrist, Cheryl Miller and Elaine Scudder. Middle row: Mariquit Hadwiger, Judy Gooch, Catherine Poyner, Sherry Lay, Peggy Clark and Donna Rhinesmith. 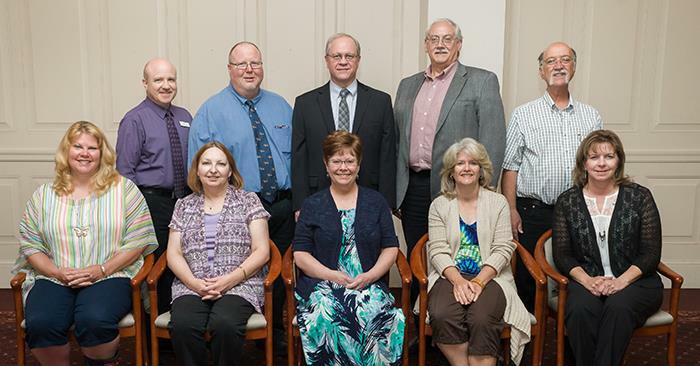 Back row: Stephanie Powelson, Tom Zoumaras, Randall Smith, Richard Coughlin, Russell Baughman and Debra Nothdurft. 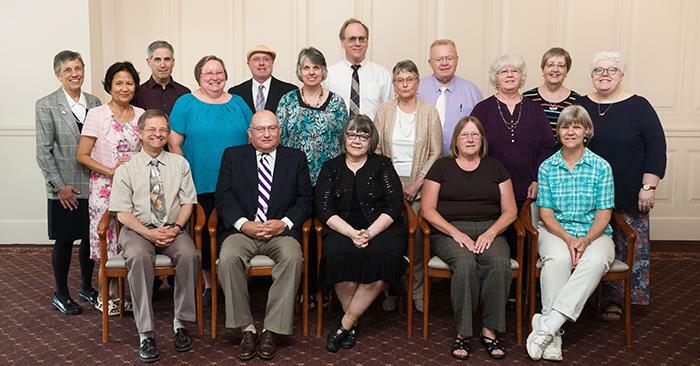 Not pictured: Faith Beane, Terry “Joe” Billington, Dexter Brookhart, Charles “Stan” Bunfill, Bob Cacioppo, Bradley Chambers, Lora Cunningham, Ronald Erickson, David Hudnall, Patrick Lecaque, Elaine McDuff, Ralph Miller, Cinda Mitchell, Kathleen Powell, Jeanette Regan, Eduardo Velasco, Cathy Williams, Cole Woodcox and David Wohlers. 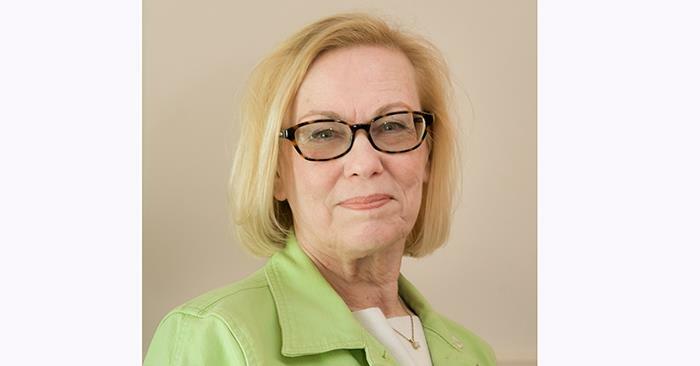 Marianna Giovannini was recognized for celebrating her 50th anniversary of service to Truman. 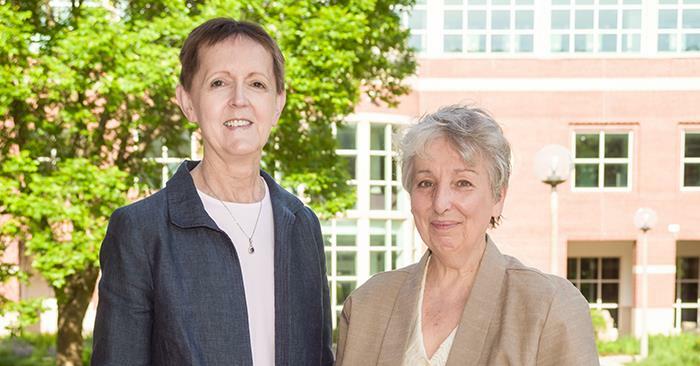 Debra Kerby (left) and Betty McLane-Iles were recognized for celebrating their 35th anniversary of service to Truman. Pictured above are the 30-year honorees. From left to right: Michael Corrick, Tammy Roberts, Nancy Asher, John Neitzke, Melannee Crist and Mohammad Shahmoradi. Not pictured: Michael Blum, Shannon Jumper, George Shinn, Chein-Hsing “Jane” Sung and Mark Thompson. Pictured above are the 25-year honorees. Seated, left to right: Melissa Passe, Barb Newcomer, Jacqueline Collett, Andrea Maag and Susan Hamilton. Back row: Edward Dunlap, Christopher Maglio, Benjamin Ogden, Ian Lindevald and Paul Detweiler. Not pictured: Debra Cartwright, Charles Combs, David Conner, Adam Davis, Robert Fisher, Joe Hamilton, Sherri Palmer, Terry Palmer and Ann Weidner. Pictured above are the 20-year honorees. Seated, left to right: Robin White, Donna Lloyd, John Green, Kathryn Brammall and Mary Shapiro. Back row: Larry Western, Adrien Presley, Brian Lamp, John O’Brien, Becky Pike, Alan Garvey and Antonio Scuderi. Not pictured: Kathy Conner, Pamela Johnson, Twila Johnson, Danny McDowell, Janie Nelson, Brian Payne, Bryan Waddle, Debbie Watson and Chad Whittom. Pictured above are the 15-year honorees. Seated, left to right: Amanda Medlock-Klyukovski, Barbara Kramer, Teak Nelson, Marie Delaney and Arletta Nelson. Back row: Daniel McGurk, Heather Ervin, George Jackson, Elizabeth Oberman and William Page. 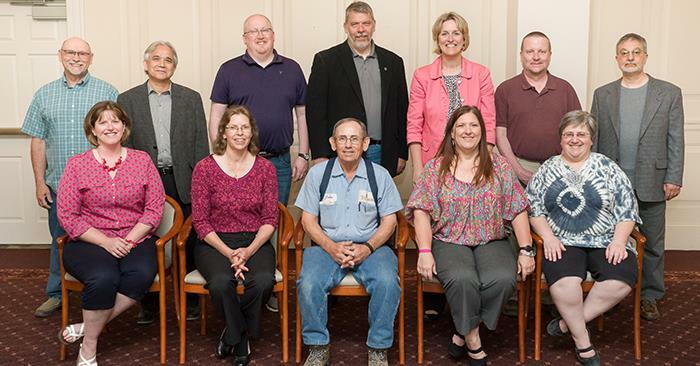 Not pictured: Tim AuBuchon, Sharon Crook, Darla Humphrey, Cella Lile, Richard Overfelt, Barbara Price, Mark Rogers, Eldon Rouse, Leon Shears and Wynne Wilbur. Pictured above are the 10-year honorees. Seated, left to right: Ted Frushour, Don Krause, Larry Sayre, Lori Shook and Emily Costello. Middle row: Sheila Thurman, Ilene Elmlinger, Rosa Virginia Mendez, Terrie Howard, Stachia Vorhees and Pamela Carte. Back row: Matthew Magruder, Mark Schultz, Matthew Derezinski, Clifford Lumsden and Tim Baker. 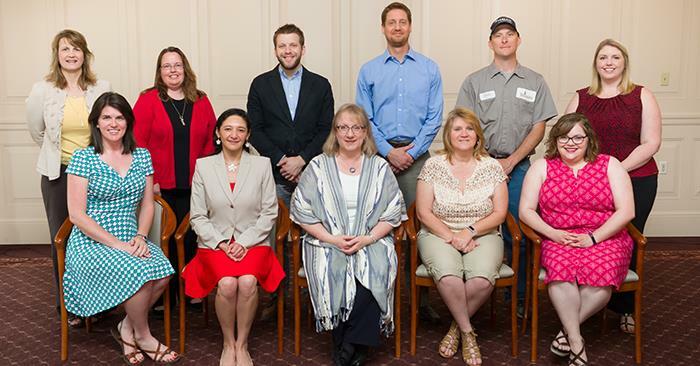 Not pictured: James D’Agostino, Datha Damron-Martinez, Lori Davenport, Vayujeet Gokhale, Jack Holcomb, Thomas Kearney, Brian Kubin, Lori Ann Ladwig, Chad Montgomery, DeeDee Moore, Lillie Schubert, Michelle Smith, Jacque Wifgall, Martha Williams and Marilyn Yaquinto. Pictured above are the five-year honorees. Seated, left to right: Kristin Kennedy, Carolina Sempertegui-Sosa, Julia Edgar, Gretchen Dahl and Megan Swingle. 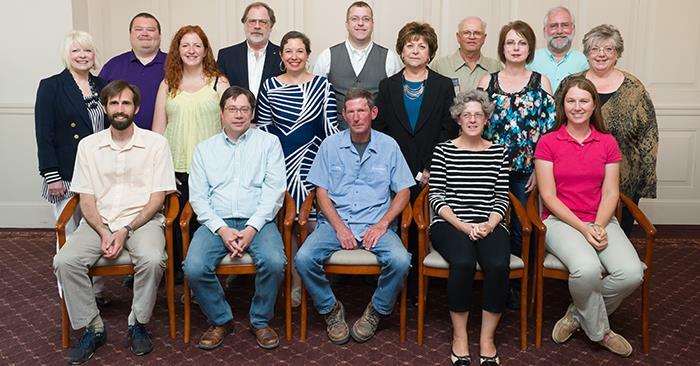 Back row: Charisse Hatfield, Melissa Garzanelli, Jonathan Vieker, Anton Daughters, John Elam and Meg Edwards. 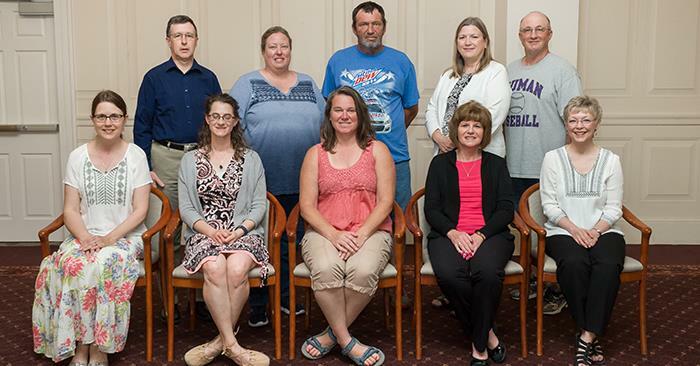 Not pictured: Jenna Canfield, Carlla Casey, Heather Cianciola, Rebecca Dierking, Amy Fuller, Betty Jenkins, Matthew Lloyd, Danielle Martel, Patrick Mawby, Kathy Otero, Denise Penick, Russell Penick, Richard Pitaniello and Kelly Walter. 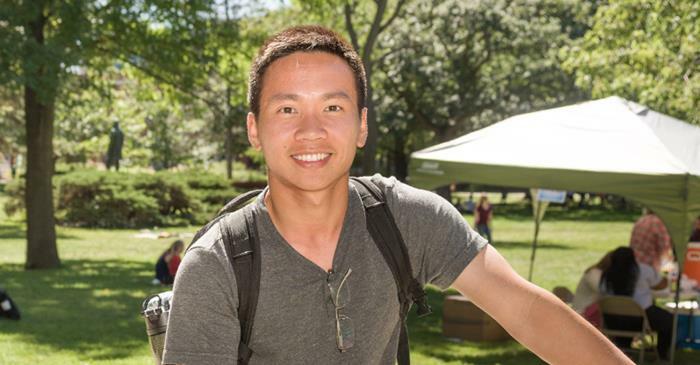 Sang Bui, a computer science major from Vietnam, will spend 70 days this summer bicycling across America to support young adults who are fighting cancer. The 4,000-mile journey will take Bui from Baltimore, Md., to Seattle, Wash., in an effort to raise money for the Ulman Cancer Fund. Through donations, his goal is to raise at least $4,500 by May 31, but funds will be accepted through the end of the ride, Aug. 12. Bui was inspired to participate in cross-country bike ride after working through some difficult personal times in the last year and coming across stories of young cancer survivors. Details about Bui’s ride, as well as the Ulman Cancer Fund and information on how to make a donation, can all be found online. Truman French student Michaela Hylen was selected as one of the 60 winners of the 2017 Many Languages, One World essay contest. 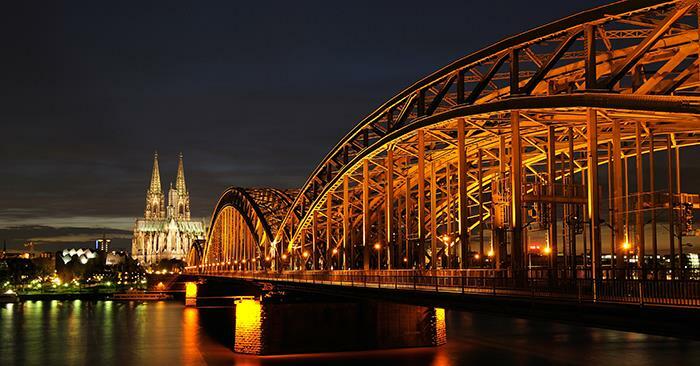 Hylen was chosen from a pool of more than 6,000 participants from 170 countries. Only 10 winners were selected to represent each of the six official languages on the United Nations: Arabic, Chinese, English, French, Russian and Spanish. As a winner, Hylen has been invited to participated in the Many Languages, One World Global Youth Forum in Boston and New York City in July.